Unblock Super Bowl live streaming with Le VPN. 15% OFF this weekend! 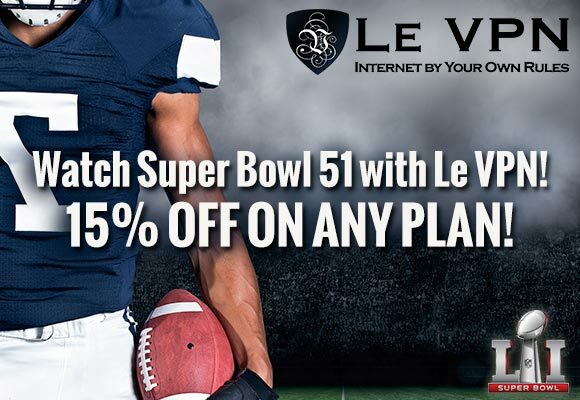 With the Super Bowl kicking off this Sunday February 5th, there’s never been a better time to take advantage of the special Le VPN deal, get 15% off all Le VPN plans during the Super Bowl weekend and unblock Super Bowl live streaming wherever you are. The Super Bowl is always one of the biggest and most watched events in the whole of North America, attracting over 100 million viewers, second only to the UEFA Champions League Final as the most watched sporting event in the world. The Super Bowl is also the second largest day for food consumption after thanksgiving in the US. If you are in the USA then you’ll have no problem finding somewhere that will be showing it, as chances are, most televisions will be playing the game. But what if you are in a country that isn’t so big on NFL or the Super Bowl, it can be quite tricky in finding a place that shows it. Even if you are a paying subscriber to Fox Sports, or perhaps Sky Sports in the UK, then you would usually be able to catch it live online. But due to licensing issues this might not be possible. Le VPN can help you unblock Super Bowl live streaming from outside of the US. 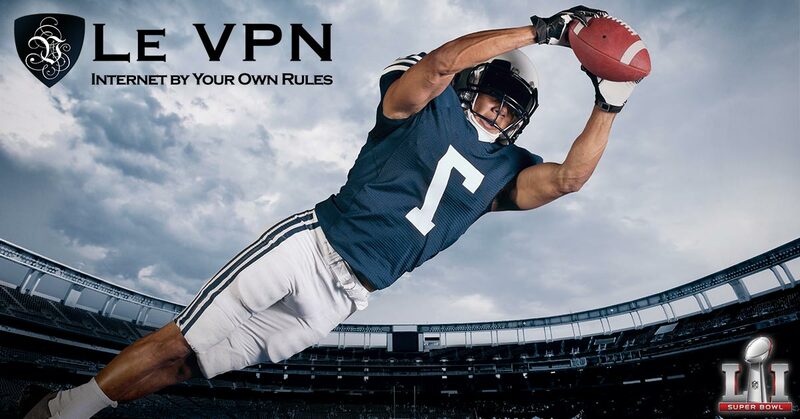 Read the full instructions on how to watch Super Bowl online with Le VPN. Make sure you don’t miss the game this year if you happen to be traveling or staying in a country that doesn’t show the game, sign up to Le VPN and switch your IP address, your virtual location, to the US in order to unblock Super Bowl live streaming and catch the game. Take advantage of the incredible deal this weekend with Le VPN subscriptions at 15% cheaper than the full price. But you’ll have to be quick, as the deal only runs this weekend, the 4th and 5th February 2017. Sign up to Le VPN today and save 15% OFF subscriptions, but hurry, only this weekend!